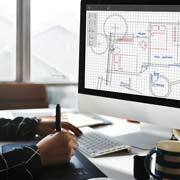 The client approached Outsource2india with a requirement that included conversion of hand-drawn sketches of floor plans to 2D computer designs using floorplanner.com. Outsource2india's prior experience in 2D floor plan conversions and their ability to meet the client's requirements encouraged the client to outsource their work to O2I. Because of a quick and concerted effort by the Outsource2india team, the project was completed in just under 24 hours, exceeding the client's expectations. The project was completed at an accuracy level of 98%, also well above the quality benchmark set at the outset of the project. As a result of the finished project, the client was highly satisfied with the O2I team's efforts and has indicated they will be outsourcing more work to the team in the future. To learn more about the full range of engineering services offered by Outsource2india and our ability to quickly adjust and utilize new tools for your project, contact a member of our team today.